1.a) 1- Lesson introduction; 2 – Your control centre, the key parts; 3 – The receptors; 4 – The neurones, nerve cells; 5 – Different types of neurones; 6 – Progress question; 7 – The central nervous system; 8 – Progress question; 9 – The nervous pathway; 10 – Example of a nervous pathway; 11 – Progress question. 1.b) SENSORY NEURONES: carry signals from receptors to the spinal cord and brain. 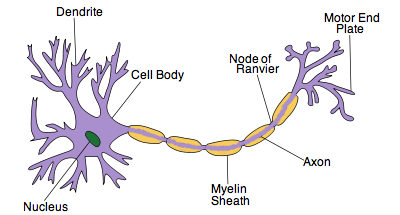 RELAY NEURONES: carry messages from one part of the CNS to another. MOTOR NEURONES: carry signals from the CNS to effectors. A nerve impulse arrives along the axon which causes a nerve-ending to release neurotransmitters. These chemicals diffuse across the synapse and into the next neuron. Esta entrada fue publicada en 4AC2016, biology por florenciaaraya. Guarda el enlace permanente.